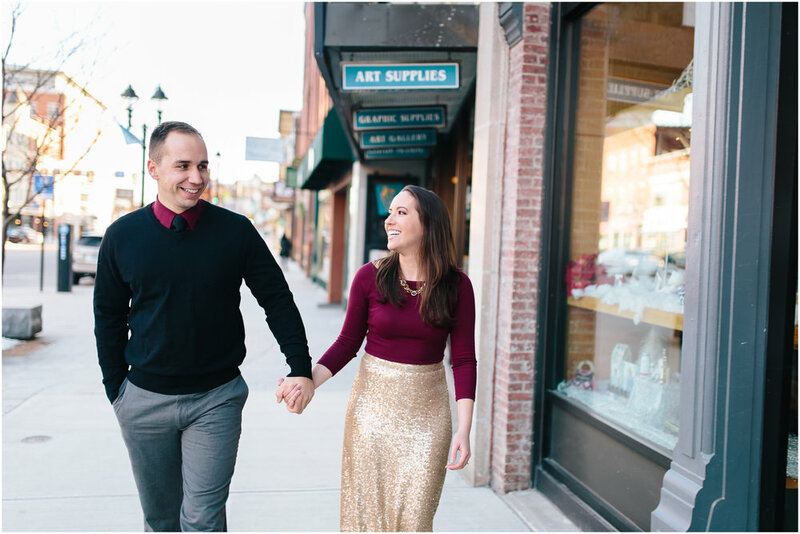 When Chiara first mentioned to me that she wanted to have a formal and classy engagement session, I was thrilled! She started to tell me about this fabulous gold sequin skirt she was going to rent from Rent the Runway, and I could barely contain my excitement. This is the story of Jack and Chiara's classy Concord engagment. 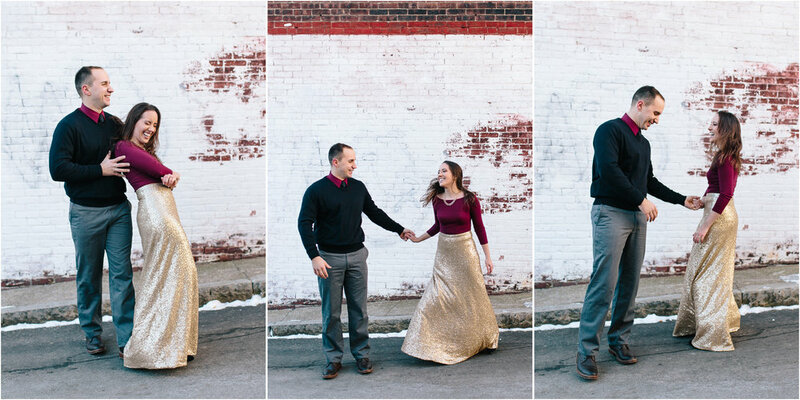 When Jack and Chiara showed up to Rollins Park that lovely February afternoon, they looked like a vision in gold and sangria red. It was so fun to chat with them, giggle with them, and brave the ice and snow with them throughout their shoot. I give Chiara extra kudos for trekking in those heels! At one point, we met a man who asked if he could take us up into Phenix Hall in Concord. He said this place was a beautiful old music hall that lent itself well to photos! Under normal circumstances, this would be fine; but we were in an alley shooting some fun shots when he approached us, and the whole situation seemed a bit...well, sketchy. He appeared friendly, but as he guided us through a back doorway and up some creaky stairs, we couldn't help but wonder if something bad was going to happen. Thankfully, as we got to the top of the stairs and he opened to door into Phenix Hall, we realized that he was genuine. Phenix Hall really was amazing and had some beautiful light! It was an adventure for sure, but Jack and Chiara were amazing! They were so willing to try new things and explore new areas, even if that meant "trekking" out of their comfort zone. Check out how I took my business on a big and beautiful adventure of printing products and creating tangible memories!